I feel like I’m in a scene straight out of Finding Nemo. I’m diving 50 fifty feet below the waves, at a site called “El Barco,” located about 100 yards off the beach of Costa Rica’s Isla del Caño Island Biological Reserve. I’m surrounded on all sides by thousands of fish– yellow and silver-striped Grunts, huge Amberjacks, vivid Striped Snapper, cautious Horse-Eye Jacks, and dozens of other species I cannot identify– swimming in huge schools that seem to ebb and flow in unison in response to my every movement. I spin around in awe, taking it all in, looking up towards the surface to see more schools passing overhead, like storm clouds blocking out the sun. Located less than an hour’s boat ride from Costa Rica’s Osa Peninsula, Caño Island has long been shrouded in mist and mystery. Several stone spheres– ancient iconic relics of the pre-Columbian Diquis culture– have been found on the island, along with myriad other archaeological treasures. There are historical accounts of famed privateer Sir Francis Drake dumping Spanish silver here in order to load more gold onto his ships. And some guides perpetuate the notion that Jurassic Park was filmed here (it was actually the Hawaiian island of Kauai). But the truth about Caño is stranger than fiction. The island gets more lightning strikes than anywhere else in the world. It’s named for its ring of singing streams, which cascade down to the sea. It boasts some of the planet’s healthiest coral reefs, and provides birthing and mating waters for humpback whales. 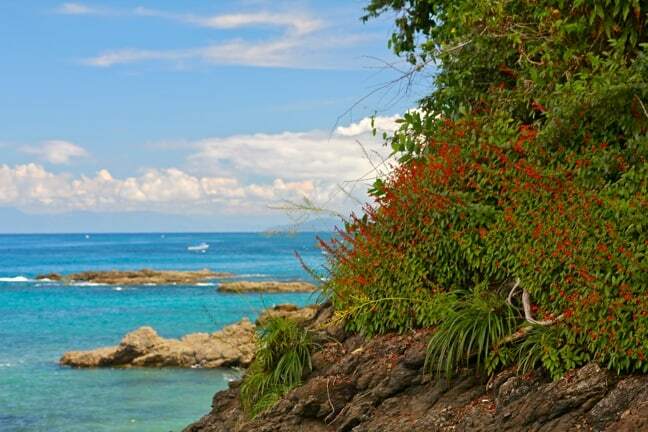 And in terms of mainland Costa Rica scuba diving, its bounty of blessings is unparalleled. Truth be told, our expectations were low when we were picked up at Casa Corcovado Jungle Lodge by dive master Wilson Cabavid of Caño Divers. 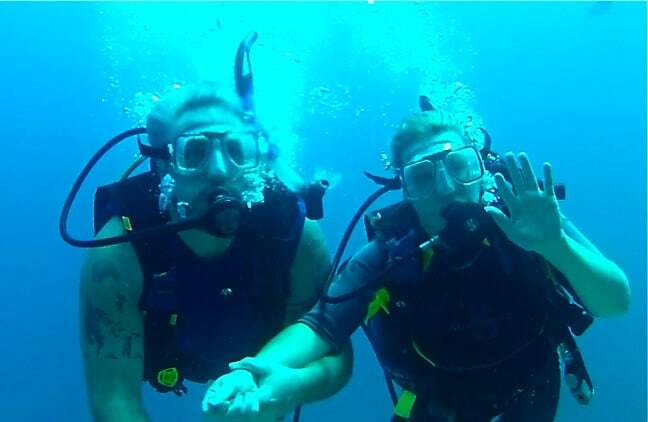 My two previous attempts at snorkeling in Costa Rica were cancelled because the water was deemed too murky. The only Scuba diving hotspot we’d heard buzz about was Cocos Island, which is located 550 km (340 miles) off the country’s Pacific coast. So, as we made our way 15 km across Corcovado Bay to an island shrouded in early morning fog, we had no idea what to expect. But, with the waters choppy from the torrential downpour we’d experienced the night before, my personal hopes were not exactly what you’d call high. To my surprise, the marine life sightings began before we even completed our 60-foot descent, as I spotted a curious Puffer Fish hanging around near the bottom of the buoy rope. I rushed to extend the 6-foot pole we use for filming underwater GoPro footage (see YouTube video above), and he immediately turned to check out his own reflection in the miniature mirror below the camera. Once Wilson finished helping the other 8 divers in our group (including a Swedish woman gamely making her first dive) to make their descent, we slowly began to explore the area, swimming between 20-30 feet tall reef walls literally swarming with fish in a rainbow of tropical colors. White-tip Reef Sharks seemed to be around every turn, with some resting on the ocean floor while others glide gracefully along the reef-tops. At one point I rounded a corner to see 7 sharks huddled close together, with hundreds of Grass Eels waving gently in the sand behind them. A Panamic Green Moray Eel peered out from a hole in the reef, baring his teeth menacingly while a fish that appeared to be stuck beside him struggled to find its way out. One of the coolest sightings of our two dives was a Bullseye Electric Ray, a Vulnerable species that can generate an electric discharge from its organs when frightened. Unfortunately, I tend to go through oxygen fairly quickly, and was forced to ascend several minutes before the rest of our group. Apparently I just missed seeing a pair of 3-foot wide Stingrays as I made my way to the surface. As we made our way back to Caño Island, Wilson told us more about the management of the biological reserve. 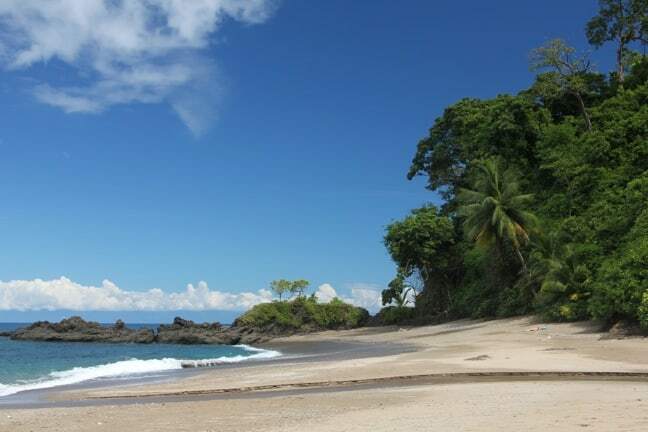 It was first opened in 1976, and has since proven to be a great model for ecotourism in Costa Rica. There used to be two short hiking trails on the island’s northwest side, but they were shut down to protect the invaluable archaeological relics and the unique stream fish and amphibian species that live there, many of which are found nowhere else in the world. Wastewater from ranger station toilets was causing an algae bloom on the coral, so those are closed now as well. With the exception of one of the most beautiful Costa Rica beaches we’ve visited, six dive sites and two snorkel areas, the majority of Caño Island is off-limits, with daily visitor numbers strictly limited. As a result, Caño Island feels unspoiled and exclusive, with less than 20 people on the expansive beach on the day of our visit. Most sat on the benches of the ranger station, or quietly munched snacks at the rustic picnic tables. But a few laid out towels on the sand and caught some morning rays, while others (like us) climbed rocks strewn with wildflowers to get more picturesque views of the scenic shoreline. Unlike mainland Costa Rica, there’s not much wildlife action to speak of here. We did see a Jesus Christ Lizard sunning himself on a tree, a Great Egret fishing along the shoreline, various lizards, and hundreds of Ghost Crabs and Hermit Crabs.